This was a challenge for me. I found this pattern in a booklet (Coats Sewing Group #920 Bold Crochet Motifs) a friend gave to me a while back. It took a couple tries to start. It uses UK stitch terminology, but US measurements. There are no specific instructions to actually join the motifs, only instructed to follow the photo. Simply titled "Coffee Table Mat". 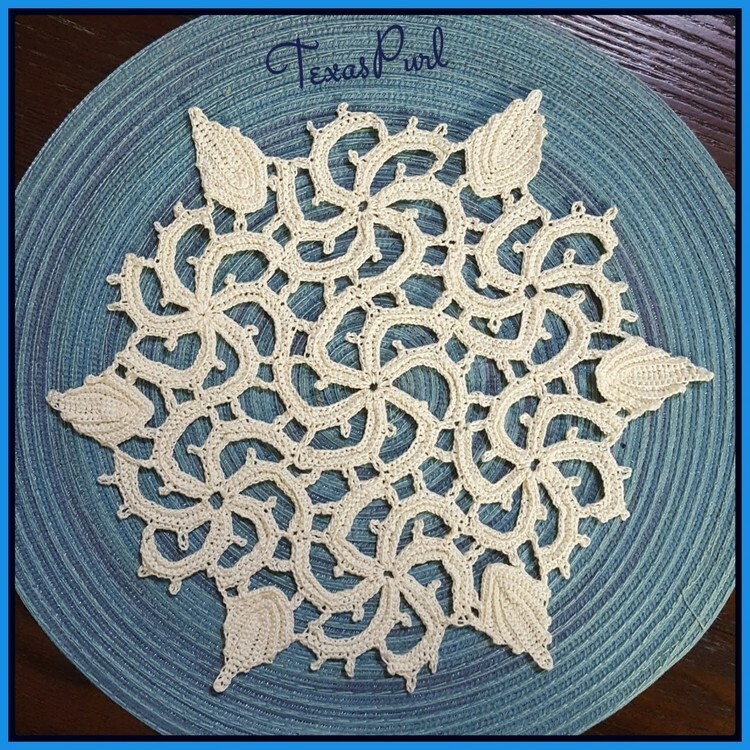 I chose to make a smaller doily, just to see if I could. Yay! Pretty! Cool that it looks so complicated but it's really only 7 motifs. Crochet terms were all over the place before the very late 1800s, where they came together pretty close to UK terms (for the US too)....until sometime after WW1 when the US went and changed theirs. Must have really confused everybody at the time. Oh my that is so pretty. It does look complicated. Very pretty. Beautiful Irish crochet. You did a splendid job. Oh wow that is so beautiful! I love how all the swirls work together. You should be very proud of it! Pretty and such an unusual pattern! Wow that's gorgeous, and so unique! Great job getting it figured out.